We were in the office early today at eargoggles and went to the keyboard straight away. Started poking around the internet and found some sleepy-good-time music. From the land of Carson Palmer and WKRP come The Spectacular Fantastic. While their name might be grandiose or an overstatement of ridiculousness, their appeal is rooted in reality. It is a soothing sound bright with life and promise that will slow down the weekend and bring some smiles to the rainy days in the coming Autumn months. Not too indie or too pop-py, just some good ‘ol shoegazin’ lemonade and kite music to relax to. 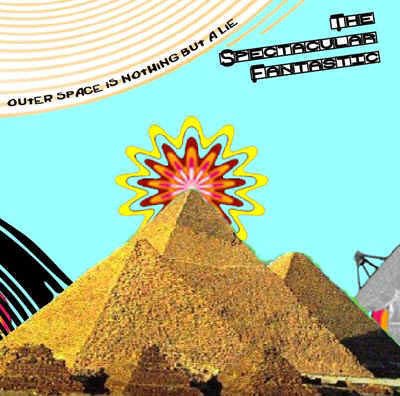 Originally a solo side-project that turned into a “full blown Rock and Roll band” that added some collaborators, and then reduced the “band” down to two members The Spectacular Fantastic has released 5 albums and 2 EPs in and around the Cincinnati area and online and have recently holed up in their studio to continue to refine their songwriting craft. They believe in making music that is very accessible and either very affordable or free. Having become one of the most recognizable names in the Cincinnati music scene, the band has spent the past year playing various festivals and venues throughout the Midwest in an attempt to become the best rock band that you’ve never heard of. Here is their 2007 release Outerspace is Nothing But a Lie.